Temple of Prambanan (also called the Temple of Loro Jonggrang) stands in Jogjakarta. It is actually not one temple, but a complex of temples, made around the 9th century. The complex is for the Shiva Hindu people and had about 200 temples. This is the myth and fact about the making of the temple. Loro Jonggrang was a daughter of a giant king called Ratu Baka (King of Death), and she had a proposal from a young noble, Bandung Bandawasa. He was handsome, wealthy and powerful, but Loro Jonggrang didn't want to marry him. Ratu Baka gave a task to Bandung Bandawasa. He had to make 1000 temples in one night, to prepare his marriage to Loro Jonggrang. Bandung Bandawasa used his supernatural force to call the genies, and they made the temples in unbelieveable speed. Loro Jonggrang, seeing that the task was almost completed, ordered her servants to help her hit the rice punchers, and made the sound of cooking, so the genies thought morning had come and they ran away. Bandung Bandawasa was angry with her act. He already finished 999 temples and when he built the 1000th, he cursed Loro Jonggrang into it. 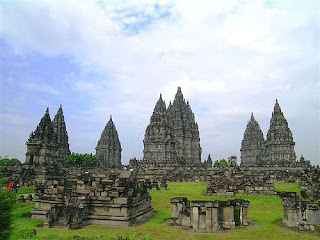 The largest temple in Prambanan complex is the Shiva temple, and inside the temple, there is a Durga (Goddess of Darkness, wife of Shiva, God of Destruction) believed as the body of Loro Jonggrang. Historians said the myth is based on the true story. In 9th century, Rakai Patapan Pu Palar, a member of Sanjaya Dynasty in Central Java, started a rebellion againts the ruling Syailendra Dynasty. Scared by his threat, King Samaratungga had his daughter Pramodawarddhani marry Rakai Patapan's son, Rakai Pitapan. Rakai Pitapan then became the King of Central and East Java and started making Prambanan complex, which completed at 915 AD.